Your baby is finally in your arms, sleeping peacefully, with a slight smile that breathes happiness and comfort, and you can’t stop looking at her. Looking at every detail, noticing her lingering newborn scent, taking notice of the small details in her hands and feet. You have finally become a mom. That long awaited dream has come true in the form of that sleeping newborn in your arms. Friend and family, and strangers in the street, congratulate you on the beauty of this transition. Good intentionally, you are given tons of advice about how to undertake your new role in motherhood. And it might be that someone mentions to you that it will be normal to feel a little out of sync because of the fluctuating hormones. That it’s normal to feel different, sad, maybe anxious… but it will be completely normal as you have just given birth, a huge undertaking for you in a physical, mental, and emotional way. So it will be normal, if you experience what is normally called “the baby blues”. But what happens if the sadness that you might feel is more intense? When you feel intense pressure to be not a good – but a supermom? When hearing your baby’s cries makes you feel like you want to run out of your home? When you cry uncontrollably and with no apparent reason? What should you do? Baby blues or sadness after birth affects approximately 80% of postpartum women. It’s characterized by feelings of sadness, irritability, anxiety, having trouble sleeping, and/or crying without reason. Postpartum sadness lasts less than two weeks and it does not impact your ability to take care or enjoy your baby. This sadness is transitory and even though it will make you feel different and sad, it will not leave you lacking complete energy and feeling like you’d like to stay in bed all day. 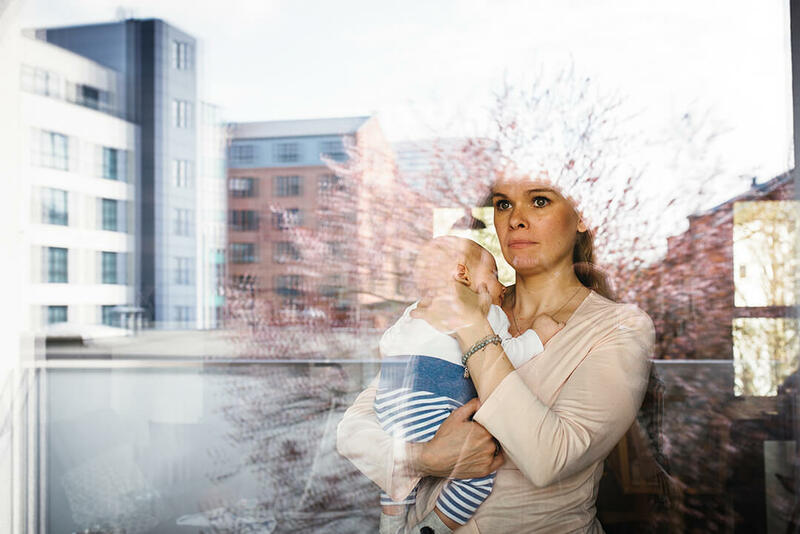 Postpartum depression should be taken seriously and requires immediate care. The important thing is to know how to recognize the symptoms and ask for help. Why? Because you should know that you are not alone. That feeling this way is not your fault. And that postpartum depression CAN be treated. Think about it: you are your baby’s whole world; her nourishment, her unconditional source of love and care, the one that takes care of her while she sleeps and that worries about every single detail about her life. Reality is that her survival depends on you, and that can be overwhelming! The first months postpartum can be really intense, a constant cycle of breastfeeding or bottle-feeding, changing diapers, sleeping for short periods of time, barely being able to carve time for yourself. It’s exhausting. On top of that, coming to the realization that your life will never be the same. Our identity goes through a profound change, where we stop being an individual and adjust to being someone’s mom, a role that will forever be a part of who we are and what we do. And it can be incredibly challenging to admit that transitioning into motherhood has been difficult. That it was not what we expected. That it can be overwhelming and exhausting. And that sometimes, it feels like a burden. But how do we speak these thoughts outloud? What is our partner, our family, our friends.. think negatively of us? What if I think negatively of myself? If it turns out I might not be a good mother after all? Pervasive thoughts like these: “I’m not a good enough mother. My baby would be better off without me. What if I hurt him unintentionally? I don’t want to deal with this anymore…” are common when experiencing postpartum depression. PPD affects 10-15% of women. It is quite common and it is nothing that you should feel ashamed about. Most importantly, PPD can be treated. IF you recognize that you are experiencing two or more symptoms of PPD you should seek help immediately. Talk to you partner or your family, and seek help from your physician, OBGyn, or midwife to get guidance in the next steps towards recovery. Postpartum depression can be treated with psychotherapy and sometimes with medication as well. Like any other illness, it requires care and a treatment plan. Postpartum depression impacts the attachment bond with your baby, and therefore her emotional development. The care that you provide for her since day one is essential for her development and growth, and if you are not feeling your best the quality of your care might be negatively impacted. The first step in becoming the best version of yourself in your role as a mother is to take care of you. If you take care of yourself, and you are ok, your baby will be ok as well. You deserve to enjoy your role as a mother, and to enjoy the moments spent with your baby. Do not be afraid to ask for help. You are not alone.